For the book by James McBride, see The Color of Water. The color of water varies with the ambient conditions in which that water is present. While relatively small quantities of water appear to be colorless, pure water has a slight blue color that becomes a deeper blue as the thickness of the observed sample increases. The blue hue of water is an intrinsic property and is caused by selective absorption and scattering of white light. Dissolved elements or suspended impurities may give water a different color. An indoor swimming pool appears blue from above, as light reflecting from the bottom of the pool travels through enough water that its red component is absorbed. The same water in a smaller bucket looks only slightly blue, and observing the water at close range makes it appear colourless to the human eye. The intrinsic colour of liquid water may be demonstrated by looking at a white light source through a long pipe that is filled with purified water and closed at both ends with a transparent window. The light turquoise blue colour is caused by weak absorption in the red part of the visible spectrum. Absorptions in the visible spectrum are usually attributed to excitations of electronic energy states in matter. Water is a simple three-atom molecule, H2O, and all its electronic absorptions occur in the ultraviolet region of the electromagnetic spectrum and are therefore not responsible for the colour of water in the visible region of the spectrum. The water molecule has three fundamental modes of vibration. Two stretching vibrations of the O-H bonds in the gaseous state of water occur at v1 = 3650 cm−1 and v3 = 3755 cm−1. Absorption due to these vibrations occurs in the infrared region of the spectrum. The absorption in the visible spectrum is due mainly to the harmonic v1 + 3v3 = 14,318 cm−1, which is equivalent to a wavelength of 698 nm. In liquid state at 20°C these vibrations are red-shifted due to hydrogen bonding, resulting in red absorption at 740 nm, other harmonics such as v1 +v2 + 3v3 giving red absorption at 660 nm. The absorption curve for heavy water (D2O) is of a similar shape, but is shifted further towards the infrared end of the spectrum, because the vibrational transitions have a lower energy. For this reason, heavy water does not absorb red light and thus large bodies of D2O would lack the characteristic blue colour of the more commonly-found light water (1H2O). Absorption intensity decreases markedly with each successive overtone, resulting in very weak absorption for the third overtone. For this reason, the pipe needs to have a length of a meter or more and the water must be purified by microfiltration to remove any particles that could produce Mie scattering. Large bodies of water such as oceans manifest water's inherent blue color. Lakes and oceans appear blue for several reasons. One is that the surface of the water reflects the color of the sky. While this reflection contributes to the observed color, it is not the sole reason. Some of the light hitting the surface of ocean is reflected but most of it penetrates the water surface, interacting with its molecules. The water molecule can vibrate in three different modes when irradiated by light. The red, orange, yellow, and green wavelengths of light are absorbed so the remaining light seen is composed of the shorter wavelength blues and violets. This is the main reason the ocean's color is blue. Some constituents of sea water can influence the shade of blue of the ocean. This is why it can look greener or bluer in different areas. Water in swimming pools (which may also contain various chemicals) with white-painted sides and bottom will appear as a turquoise blue. 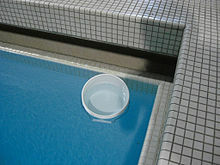 Clean water appears blue in white-tiled swimming pools as well as in indoor pools where there is no blue sky to be reflected. The deeper the pool, the bluer the water. Scattering from suspended particles also plays an important role in the color of lakes and oceans. A few tens of meters of water will absorb all light, so without scattering, all bodies of water would appear black. Because most lakes and oceans contain suspended living matter and mineral particles, known as colored dissolved organic matter (CDOM), light from above is reflected upwards. Scattering from suspended particles would normally give a white color, as with snow, but because the light first passes through many meters of blue-colored liquid, the scattered light appears blue. In extremely pure water—as is found in mountain lakes, where scattering from white-colored particles is missing—the scattering from water molecules themselves also contributes a blue color. The hue of the reflected sky also contributes to the perceived color of water. 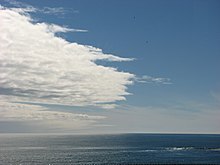 Another phenomenon that occurs is Rayleigh scattering in the atmosphere along one's line of sight: the horizon is typically 4–5 km distant and the air (being just above sea level in the case of the ocean) is at its densest. This mechanism would add a blue tinge to any distant object (not just the sea) because blue light would be scattered into one's line of sight. The surfaces of seas and lakes often reflect blue skylight, making them appear bluer. The relative contribution of reflected skylight and the light scattered back from the depths is strongly dependent on observation angle. Glaciers are large bodies of ice and snow formed in cold climates by processes involving the compaction of fallen snow. While snowy glaciers appear white from a distance, up close and when shielded from direct ambient light, glaciers usually appear a deep blue due to the long path lengths of the internal reflected light. Relatively small amounts of regular ice appear white because plenty of air bubbles are present, and also because small quantities of water appear to be colorless. In glaciers, on the other hand, the pressure causes the air bubbles, trapped in the accumulated snow, to be squeezed out increasing the density of the created ice. Large quantities of water appear blue, therefore a large piece of compressed ice, or a glacier, would also appear blue. 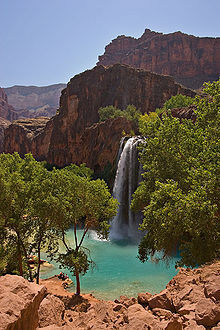 High concentrations of dissolved lime give the water of Havasu Falls a turquoise color. Dissolved and particulate material in water can cause discoloration. Slight discoloration is measured in Hazen units (HU). Impurities can be deeply colored as well, for instance dissolved organic compounds called tannins can result in dark brown colors, or algae floating in the water (particles) can impart a green color. Apparent color is the color of the whole water sample, and consists of color from both dissolved and suspended components. True color is measured after filtering the water sample to remove all suspended material. Testing for color can be a quick and easy test which often reflects the amount of organic material in the water, although certain inorganic components like iron or manganese can also impart color. Water color can reveal physical, chemical and bacteriological conditions. In drinking water, green can indicate copper leaching from copper plumbing and can also represent algae growth. Blue can also indicate copper, or might be caused by syphoning of industrial cleaners in the tank of commodes, commonly known as backflowing. Reds can be signs of rust from iron pipes or airborne bacteria from lakes, etc. Black water can indicate growth of sulfur-reducing bacteria inside a hot water tank set to too low a temperature. This usually has a strong sulfur or rotten egg (H2S) odor and is easily corrected by draining the water heater and increasing the temperature to 49 °C (120 °F) or higher. The odor will always be in the hot water pipes if sulfate reducing bacteria are the cause and never in the cold water plumbing. The color spectrum with water indicators[clarification needed] is wide and, if learned, can make identifying and solving cosmetic, bacteriological and chemical problems easier. Glacial rock flour makes New Zealand's Lake Pukaki a lighter turquoise than its neighbors. 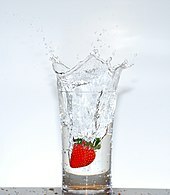 The presence of color in water does not necessarily indicate that the water is not drinkable. Color-causing substances such as tannins may be harmless. Color is not removed by typical water filters; however, slow sand filters can remove color, and the use of coagulants may also succeed in trapping the color-causing compounds within the resulting precipitate. Particles and solutes can absorb light, as in tea or coffee. Green algae in rivers and streams often lend a blue-green color. The Red Sea has occasional blooms of red Trichodesmium erythraeum algae. Particles in water can scatter light. The Colorado River is often muddy red because of suspended reddish silt in the water. Some mountain lakes and streams with finely ground rock, such as glacial flour, are turquoise. Light scattering by suspended matter is required in order that the blue light produced by water's absorption can return to the surface and be observed. Such scattering can also shift the spectrum of the emerging photons toward the green, a color often seen when water laden with suspended particles is observed. Various cultures divide the semantic field of colors differently from the English language usage and some do not distinguish between blue and green in the same way. An example is Welsh where glas can mean blue or green. Other color names assigned to bodies of water are sea green and ultramarine blue. 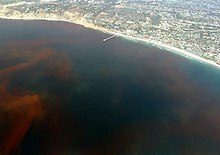 Unusual oceanic colorings have given rise to the terms red tide and black tide. 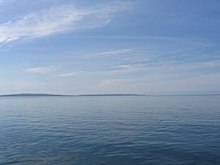 The Ancient Greek poet Homer uses the epithet "wine-dark sea"; in addition, he also describes the sea as "grey". William Ewart Gladstone has suggested that this is due to the Ancient Greeks classifying colors primarily by luminosity rather than hue, while others believe Homer was color-blind. ^ Pope; Fry (1996). "Absorption spectrum (380-700nm) of pure water. II. Integrating cavity measurements". Applied Optics. 36 (33): 8710–23. Bibcode:1997ApOpt..36.8710P. doi:10.1364/ao.36.008710. PMID 18264420. ^ WebExhibits. "Colours from Vibration". Causes of Colour. WebExhibits. Archived from the original on 2017-02-23. Retrieved 2017-10-21. Heavy water is colourless because all of its corresponding vibrational transitions are shifted to lower energy (higher wavelength) by the increase in isotope mass. ^ Braun & Smirnov 1993, p. 612:"...any simple answer is bound to mislead. It turns out that contributions to the observed color are made both by reflected skylight and by the intrinsic absorption." ^ Rossing, Thomas D.; Chiaverina, Christopher J. (1999). Light science: physics and the visual arts. Springer Science+Business Media. pp. 6–7. ISBN 978-0-387-98827-6. ^ Braun & Smirnov 1993, p. 613:"...the relative contribution of reflected skylight and the light scattered back from the depths is strongly dependent on observation angle."